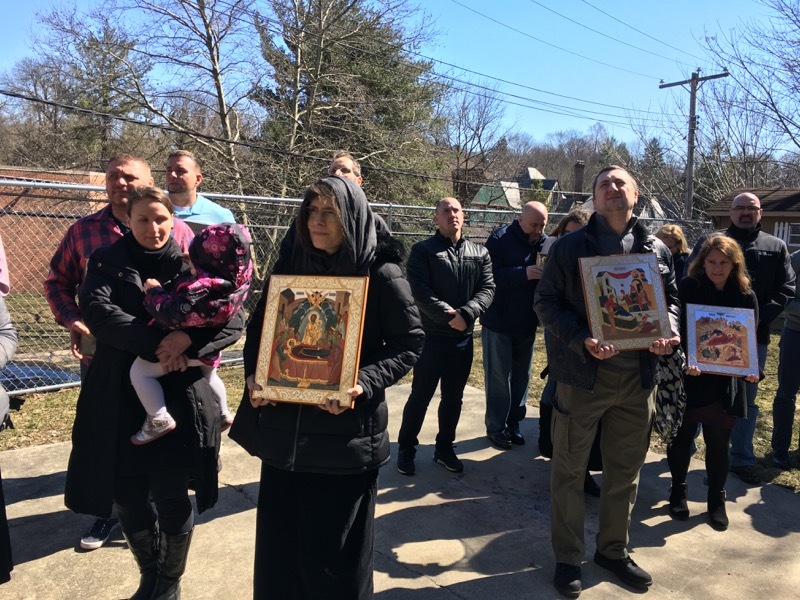 On Sunday March 21, 2019 the faithful of St. Nicholas Serbian Orthodox Church in Elkins Park (Philadelphia) PA., gathered to celebrate the Sunday of Orthodoxy and the restoration of the holy icons to the Church. The church was filled with both young and old, many of who received Holy Communion at the Divine Liturgy. Following the Prayer Behind the Ambo the faithful, many carrying their most beloved icon that they brought from their homes, followed their parish priest in procession around the church. A beautiful, sunny, spring-like day greeted the faithful as they exited church singing the Troparion “We venerate Thine Immaculate Icon…” pausing on the sides of the church to pray for the living, the departed, the community, and for the whole world. The procession concluded with the reading of the reading by all of the Synodikon of the Seventh Ecumenical Council, and the Nicene Creed. In the evening, the Orthodox clergy and faithful of the Greater Philadelphia area gathered at St. Michael the Archangel Orthodox Church in Wilmington DE. for Vespers. 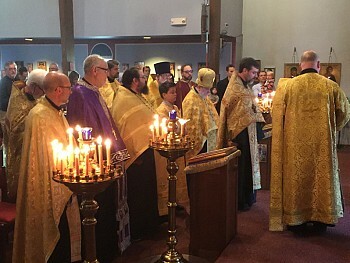 Clergy representing the Albanian, American, Antiochean, Carpatho-Russian, Georgian, Greek, Serbian and Ukrainian Orthodox jurisdictions were present, manifesting that the unity of Orthodoxy is, indeed, a most precious diadem to all. Responses were sung by the Pan-Orthodox Choir of Philadelphia, under the direction of Dan Drobish. Following Vespers and the processions with icons, the homily was given by Fr. Milorad Orlic. Fr. Milorad reminded the faithful that each and everyone is a living icon into which God (the first and greatest Iconographer) had written in His image and likeness. But we work is not completed. God summons us to be his co-iconographers – our askesis and His Grace – in to the continuing writing of us “…unto a perfect man, unto the measure of the fullness of the stature of Christ”. (Eph. 4:13). Following the dismissal, fellowship continued in the parish’s social hall, where a wonderful Lenten meal was enjoyed by all present.